FAQ · User guide of MISP Malware Information Sharing Platform, a Threat Sharing Platform. How can I see all the deleted events in a MISP instance? How do I harden my MISP instance? Is there a MISP maintenance mode? What can go wrong if I update MISP? How to enable the csv import module? Why do I see &apos;The request has been black-holed&apos; when I submit forms? The following page hosts most frequently asked questions as seen on our issues and gitter. "model_id": "<Event ID retrieved from the query before>"
If you have any permission issues, please set the permissions to something sane first. This means that the main repository has an update available. You can check the hardening section in the install guide. Optional MISP.maintenance_message Great things are happening! MISP is undergoing maintenance, but will return shortly. You can contact the administration at $email or call CIRCL. The message that users will see if the instance is not live. Critical MISP.live true Unless set to true, the instance will only be accessible by site admins. If your MISP instance is outdated, meaning ONLY the core, not the modules or dashboard or python modules, you well see the following. Once you click on update MISP you will be asked confirmation. If you are not on a branch, the UI will tell you this, the update will fail. If you cannot write the .git files and directory as the user running the web server (and thus PHP), the update will fail. The following diagnostic check will let you know if you can update or not. 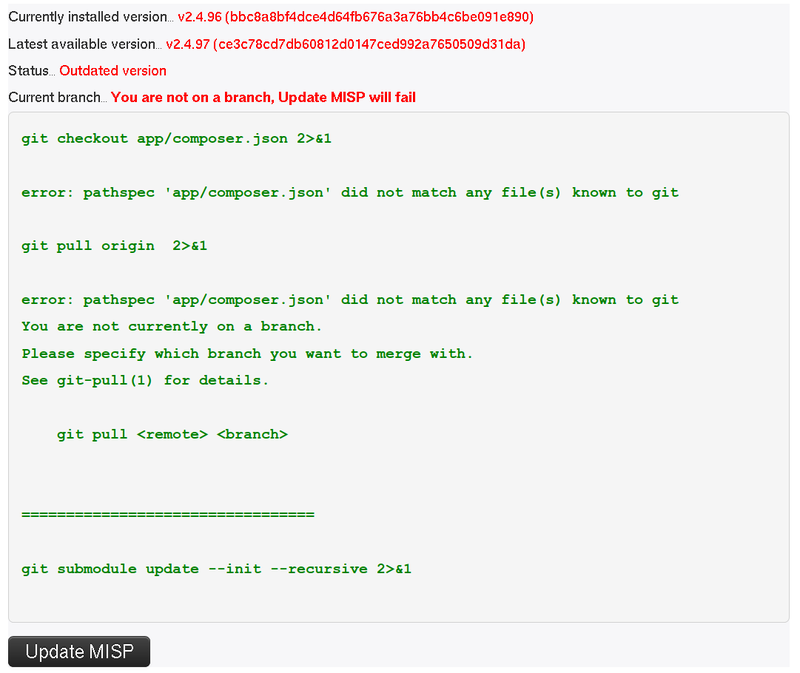 In case you get a file not found on .git/ORIG_HEAD, this means that you have never updated your MISP OR you have installed git from an archive file (like .zip/.tar.gz or similar) Try to click update MISP and see what happens. In theory nothing. We put great effort into protecting the integrity of the data stored in your MISP instance. DB upgrades happen upon login or on reload once you have update the repository. You cannot "break" anything by clicking Update MISP worse case it will complain about something and you will certainly find the answer on this page. IF not, please open an issue on GitHub or come to our gitter chat to see if the community can help. This is not an error and can be ignore. Nothing will be impacted by this. If you get have a Connection refused state on your modules one of the following might be true. If they are not installed, check out this section of the INSTALL guide of misp-modules. [warning] Running misp-modules like this will certainly kill it once you quit the session. Make sure it is in your /etc/rc.local or some ther init script that gets run on boot. There is no official procedure to uninstalling a MISP instance. If you want to re-use a machine where MISP was installed, wipe the machine and do a fresh install. Consider the data in your MISP instance as potentially confidential and if you synchronized with other instances, be respectful and wipe it clean. In some cases, for instance if a newer version of a MISP object is present on the server but not yet on PyMISP, you want to reflect the current state in your PyMISP installation. sudo pip3 install -I . Important Make sure that you don&apos;t remove "tag editor" from sync users, or you&apos;ll be stripping tags from synchronized data. First you have to enable the import services: double-click on "false" in the very first line and change it to "true". In Server Settings & Maintenance -> Plugin Settings -> Import -> set "Plugin.Import_csvimport_enabled" to true. Afterwards you&apos;ll find the csvimport from within the newly created event: "Populate from..."
Don&apos;t use from the main site ("Import from..."). That&apos;s a security measure for form tampering protection. All forms have a timeout (~15min) and all of them can only be submitted once. If you use your browser&apos;s "back" button and resubmit the form MISP will consider it as a potential attempt at form tampering. Now, I only have Org Admin. Note down the ID you want to upgrade. Let&apos;s say this is 2 for the example&apos;s sake. Note down the role ID you want to upgrade. Let&apos;s say this is 1 for the example&apos;s sake. 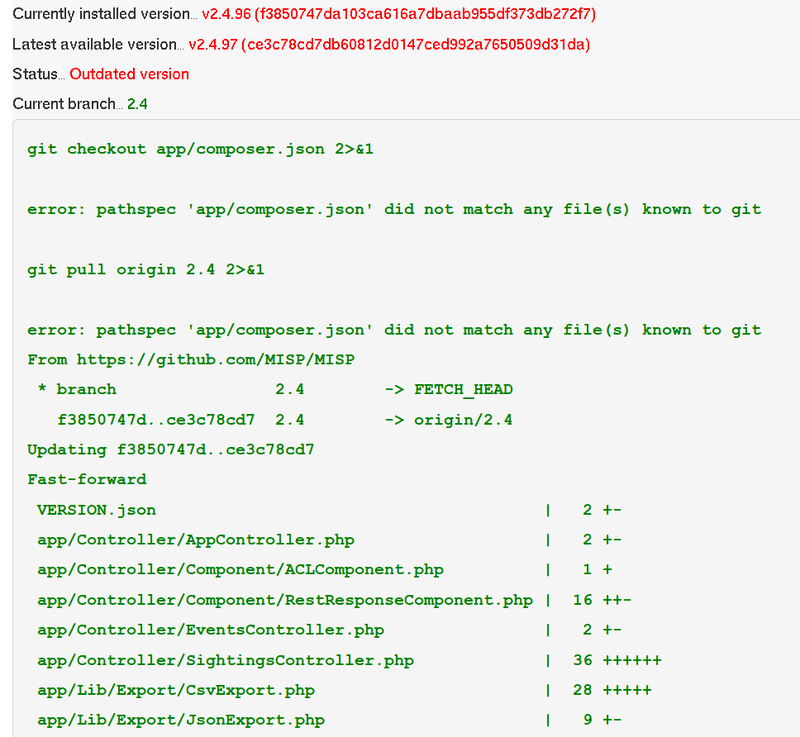 Warning: app/Config/config.php is not writeable. This means that any setting changes made here will NOT be saved.